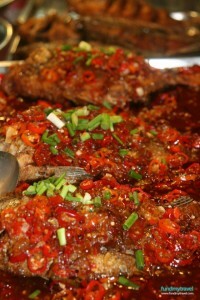 spicy grilled fish from Thailand. By far one of the most pleasurable sensations we occur when travelling abroad is taste. Different cultures cater for different cuisines and it is this diversity which makes eating abroad a favoured pastime for the vast majority of travellers. It is no surprise as to why taste has such a profound affect on a travellers senses; there are more than 100,000 taste buds on the human tongue which categorise our tastes into five distinct flavours: sweet, bitter, sour, salty and umami – foreign cuisine often exposes us to new variations of these flavours that we’re not commonly accustomed too and creates either a pleasant or unpleasant sensation. If you’re wondering what the term umami means then you might want to think why you always have that craving for Thai food. The term ‘Umami’ is a flavour that was originally categorised by a Japanese scientist called Dr. Kikunae Ikeda and refers to a savoury flavour found in numerous asian dishes. Perhaps this is why so many travellers crave asian food after trips to nations with identifiable umami empowered dishes such as Thailand, India and China. Aside from the fact that taste causes memorable human chemical reactions it is important to remember that taste is (and always has been) a great way to create an identity for a country. Pasta and Pizza are most associated with Italy whilst Noodles and Fried Rice are related China. Whilst it is common to categorise nations by their cuisines, some stereotypes can be misleading. For example, did you know that whilst spaghetti is most associated with Italy, it has its origins in China? and that the British ‘cuppa’ tea actually has routes stretching from Asia to the Caribbean? And it’s not only the food that creates an identity, but the way we eat it. Most of us are accustomed to eating with a knife and fork despite knowing very little that its origins are the result of an 11th century niece of a Byzantine Emperor who was mocked and ridiculed by clerics for using golden cutlery at her wedding. In China, people have eaten with chopsticks since the Shang Dynasty (1776-1122BC) whilst in Morocco people eat with their hands and use a piece of bread as a utensil. These differences also help define an experience, most people who have ventured to China with no chopstick skills can most-likely relate to the mixed feelings of novelty and frustration that occurred the first time they tried to pick food from their plates whilst visitors to the Philippines will most certainly have had issues trying to cut meat with a spoon rather than a knife. Nevertheless, no matter what the routes of a certain cuisine may be or the manner in which we eat it, the sense of cultural attachment to cuisine is something that helps complete the experience of travelling abroad. Whether you’re sipping down a hot bowl of Borscht in a Ukrainian cafeteria, twisting spaghetti around your fork at a cafe in Rome or enjoying a box of street noodles in Beijing – the sensation of taste will be a factor that helps define your experience. As travellers, we owe a lot to this sensation.